Cuyler Harbor is spectacular and usually empty. 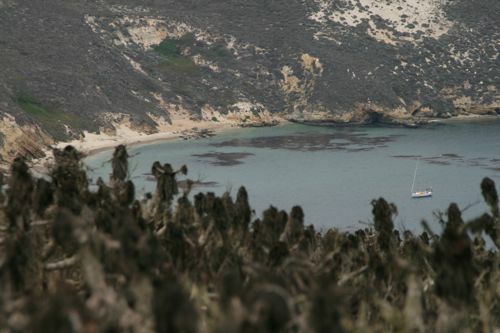 It is to our minds, the most beautiful spot to drop your hook in all the Channel Islands. 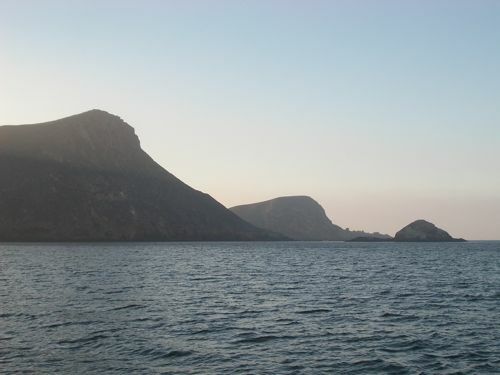 Its remarkable rock formations, towering cliffs and Prince Island, which lies at the mouth of the harbor make this the only real harbor in the northern tier of islands. That said, most local mariners rarely venture here because of frequent punishing winds and high seas. It’s also a bit of a schlep from Oxnard/Ventura. Prince Island — If you’re not a ranger, an ornithologist or some sort of bird, you’re not allowed to set foot on this avian refuge. 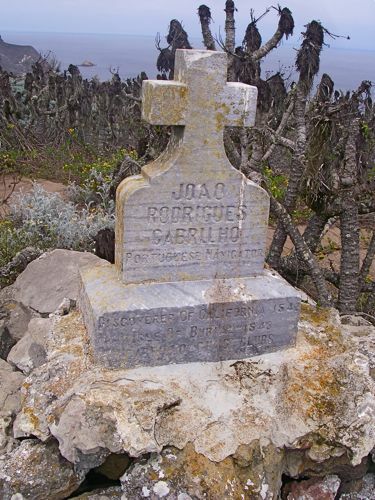 San Miguel is the rumored final resting place of Juan Cabrillo, who “discovered” the island sometime around 1540, and died there after an altercation with the Chumash in 1543. 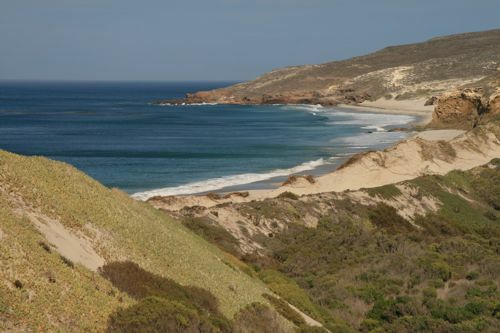 While further away from Oxnard/Ventura, and more challenging in terms of navigation than most other off-shore destinations, the trip to San Miguel, and Cuyler specifically, is well worth the effort (even considering all of Fagan’s cautionary comments, which are definitely worth reading). Here’s an exception to the claim that the harbor is usually deserted — snow birds on their way from Washington to Baja. As this is a fairly large anchorage, chances are great that there will be plenty of room and very little company to contend with except for the occasional crabber or dive boat and migrants from the north heading for the Sea of Cortez. NOAA chart 18727 depicting our entrance and exit from Cuyler Harbor. Click for larger chart. There are two possible ways in and out of Cuyler. 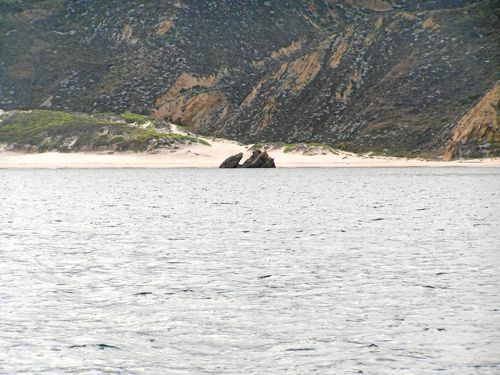 Our first trip to Cuyler was by way of Point Bennett on the North West tip of San Miguel, around Castle Rock, past Simonton Cove and around Harris Point, about two-thirds of a circumnavigation. That’s the long way. It’s also the beautiful way. Looking NW from the anchorage at Hare Rock, Hill 485 to the left, east side of Harris Point in background. The APPROACH picture below shows Nifty Rock in the foreground, the peninsula a bit closer and Hill 485 and Hare Rock in the background. The shoulder of Harris Pt. is at the far right. 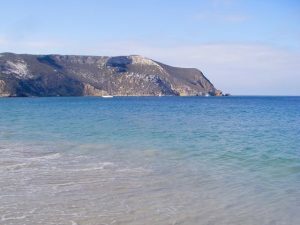 Following our route from the north, first identify Harris Point, which is unmistakable due its conspicuous hill, shoulder, and steep cliffs, and 288′ Prince Island, which lies approximately a mile offshore at the East side of the anchorage. 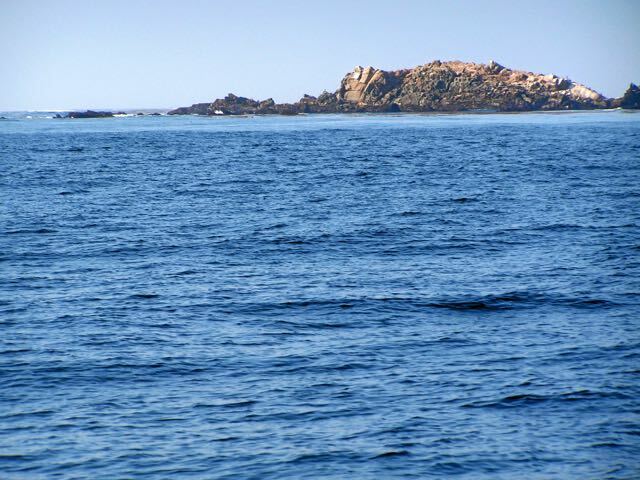 APPROACH: Entering Cuyler from the NE, passing Harris Pt with Nifty Rock, Hare Rock and hill 485 in sight. Our approach was from the NNW, keeping well off shore. As Nifty Rock and Hare Rock are 250 yards and 300 yards off shore respectively, we kept about 400 yards off shore lining just left of Nifty Rock and Hare Rock. 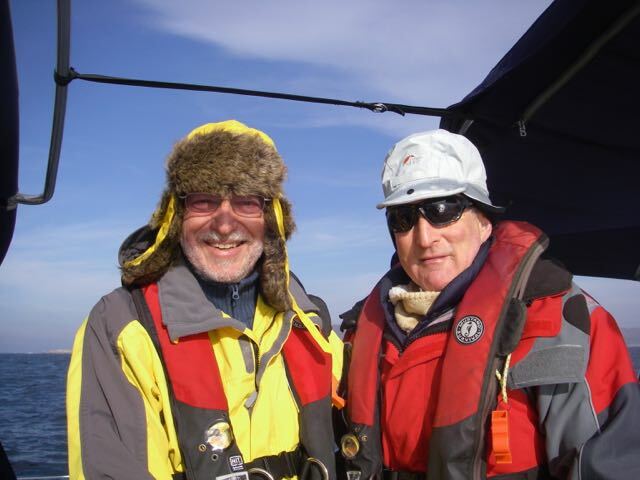 After Hare Rock, we sighted Bat Rock and established the same offset, which put us on a southerly heading. 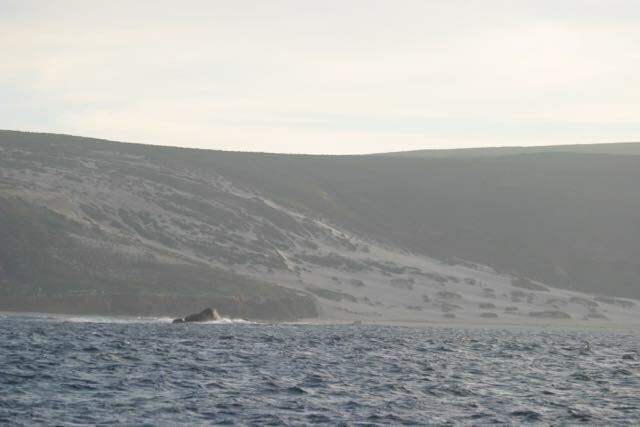 We continued about 200 yards past Bat Rock before making a slight westerly turn, keeping a close eye on our depth gauge. We dropped a single hook in about 25 feet of water, quite close to the anchor symbol on the chart. Part of a prudent sailor’s preparation for a journey to Cuyler should include careful study of the chart, Coast Pilot and Fagan’s Cruising Guide. 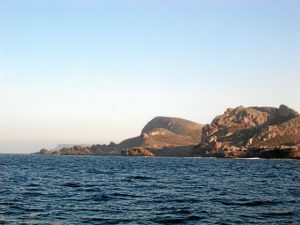 In Feb 2011 (I’m not sure I’d recommend going to San Miguel in the winter, but we were very, very lucky and had the best weather we’d ever seen between Santa Ana events), we approached from the north side of Prince Island. 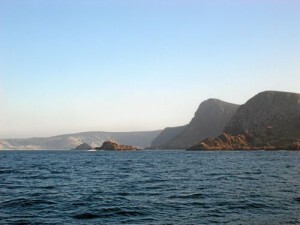 There is a small island near Prince and some hidden rocks just past the end of the island. Once we were abeam those rocks we put Hill 485 at 1 o’clock. 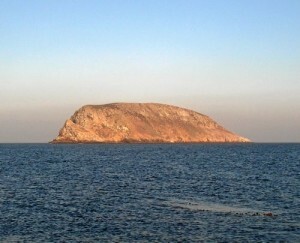 The sun was in our eyes and we proceeded slowly until we could identify Hare Rock. 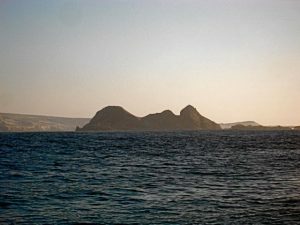 From there, we intercepted our earlier course, turning south and passing a few hundred yards east of Bat Rock and continuing south a few hundred yards before turning into the anchorage. 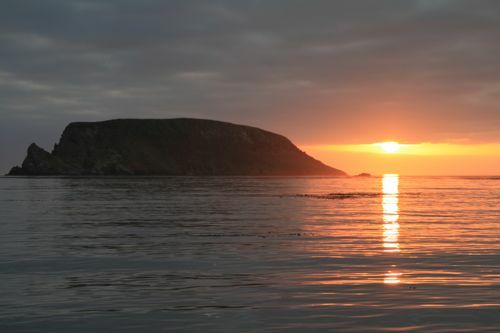 We anchored in 30 feet and listened to Elephant Seals squawk, whine, moan and bellow all night. BTW – when approaching from the east, the breakers on middle rock and others in the center of the harbor make the area look impassable if there’s any sort of swell. 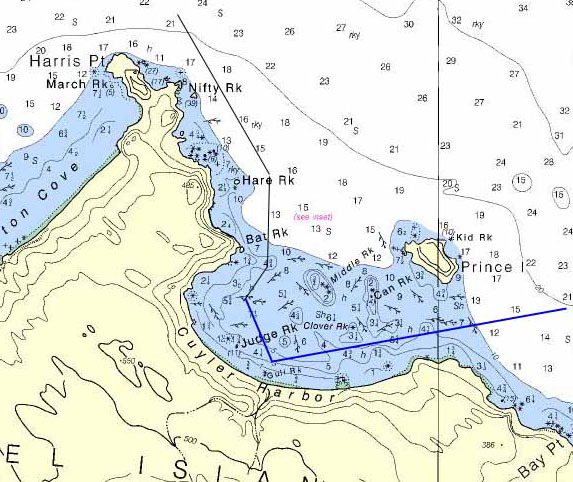 Press on and reevaluate the conditions when abeam the west end of Prince Island. 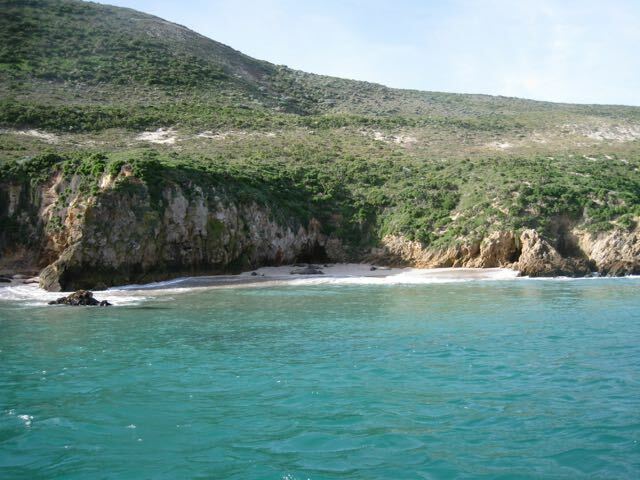 It’s quite likely that you’ll find a relatively calm passage to the anchorage. BTW2 – historically this is a very kelpy area, but on our Feb 2011 trip and again in 2017 it was 95% clear. All sailors speak from experience, just not necessarily their own. Even so the consensus among locals is that this can be a very hazardous spot. On the other hand, Fall provides some excellent weather for this trip and the consensus is Sept. and Oct. are the best months to venture this way. We decided not to leave the same way we came in and departed the anchorage and headed south toward Gull Rock, taking care to avoid the numerous kelp beds while monitoring the depth. About 200 yards north of Gull Rock we turned east and paralleled the shore, staying about 100 yards off while maintaining a course which took us between the shore and Clover Rock, which was awash. We continued on a course that kept us between the shore and Prince Island and stayed close to shore until we were abeam of Prince Island and clear of the reef. Obviously the reciprocal of our departure route could be used as an approach into the anchorage. Gull Rock marks the entrance to Nidever canyon, which provides access to the ranger station. It’s also our initial point for a westerly departure from the harbor. 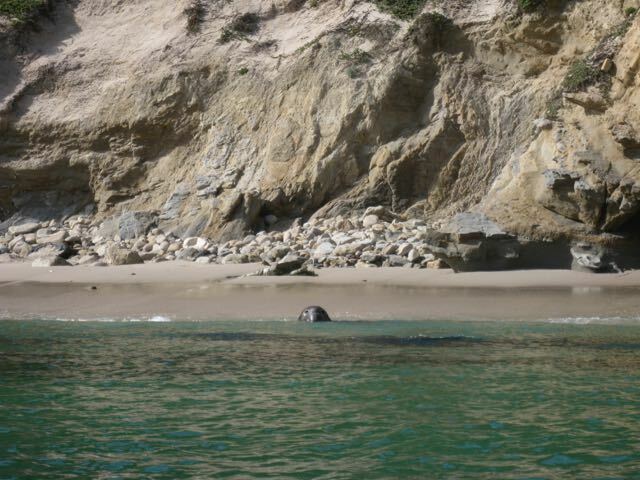 However, it is a somewhat tricky approach requiring careful avoidance of the kelp beds and keeping well inside of Clover Rock. 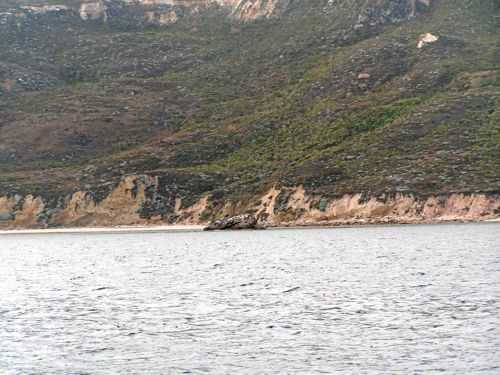 While one might be tempted to set a course midway between the shore and Prince Island heading straight into the anchorage, this would take you between Middle Rock and Clover Rock, both of which are exposed only at low tide, and may shoal up in between them depending on the surge and swell conditions. 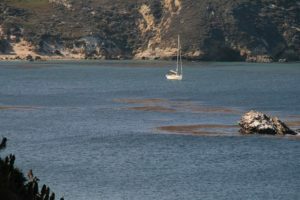 Kelp beds abound and there are several small reefs/rocks which are only visible at low tide. In addition, Fagan cautions about a foundation of an old pier at the south corner of the anchorage that should be avoided. 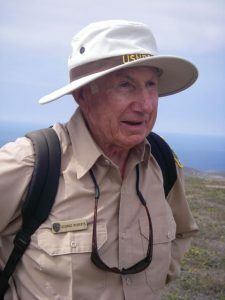 Ranger George Roberts, who retired from the Park Service and returned to San Miguel as a volunteer. 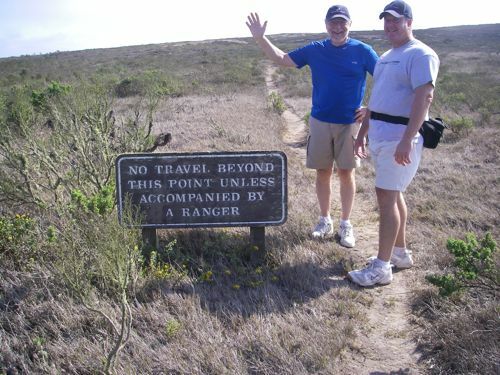 No landing permit is required but you are supposed to sign the register at the trail head before ascending to the ranger station. 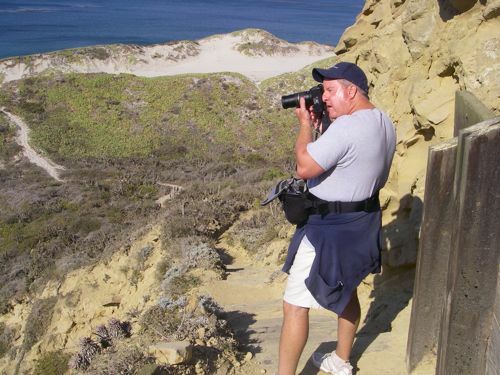 A guided tour with a park ranger can be arranged by calling the Park headquarters in Ventura at (805) 644-8262. You can also contact the ranger on channel 16. 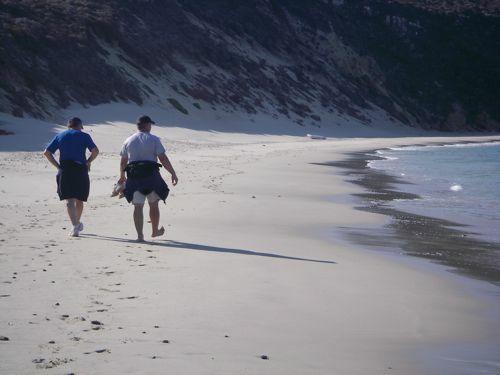 Excursion parties generally meet the ranger at 0900 near the four palm trees on the beach. 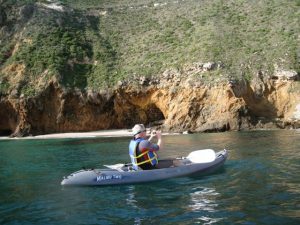 Anyhow, we launched the dinghy and met the ranger at the top of Nidever canyon. He juggled his schedule a bit and took us on a hike to the Caliche Forest. Frankly, I was very nervous about leaving Sancerre unattended, so we abbreviated our excursion. That turned out to be a good decision as the wind came up and the anchor needed tending by the time we got back aboard. 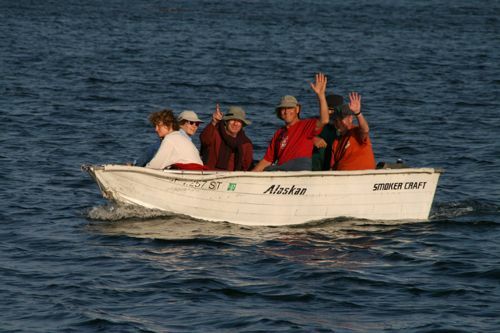 I will never leave the boat unattended in this anchorage again. 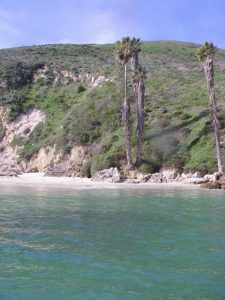 The best place to go ashore is usually at the NW corner of the bay near the palm trees, but you can encounter hazardous surf conditions. Be ready to abort your landing plans or be prepared for a swim. 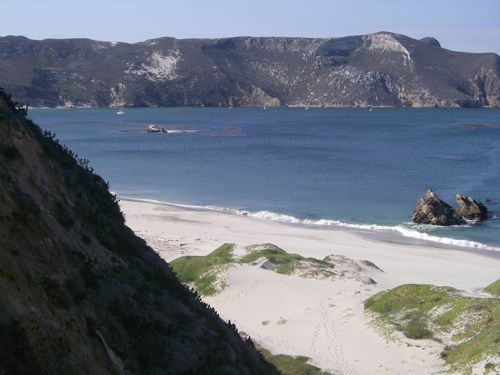 Fagan also cautions that a landing attempt opposite the path to the ranger camp is to invite a dunking, but in Sept. 2017 there was about a 6 inch break, so it pays to scout the beach before picking your landing spot. This is about the easiest spot to get ashore. 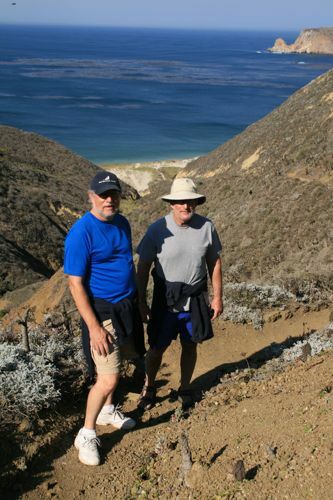 It’s a trek from Nidever canyon, but the surf is less of a problem here… usually. 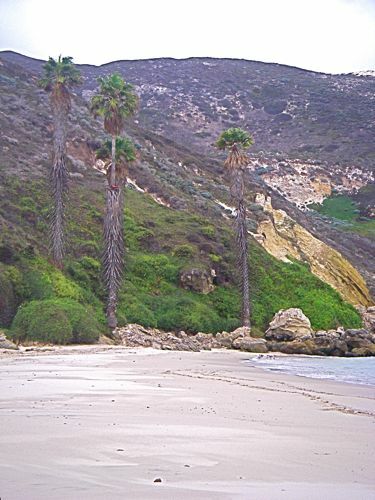 There are two stories that purport to explain the curiously out-of-place palm trees on the beach. First story: the palms are courtesy of a movie company that filmed a feature there in the 1920’s. I don’t know if/how that story connects with what appears to be the real story at islapedia.com, but frankly, we like the movie-maker story legend better, even if it’s not true. Kayaking in the Fall is superb, but we got lucky in February, too. 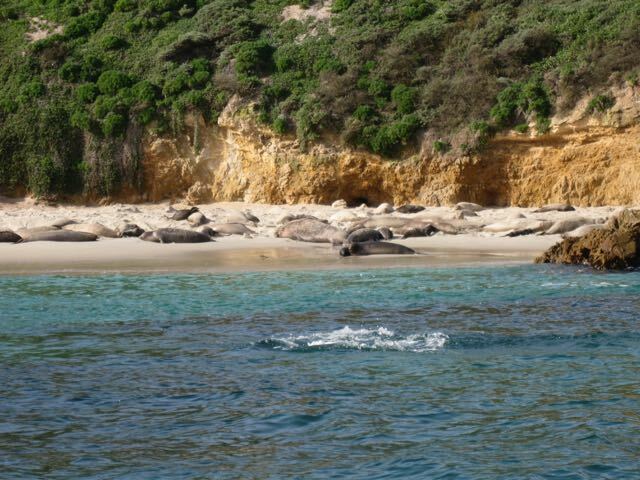 Be cautious of elephant seals. 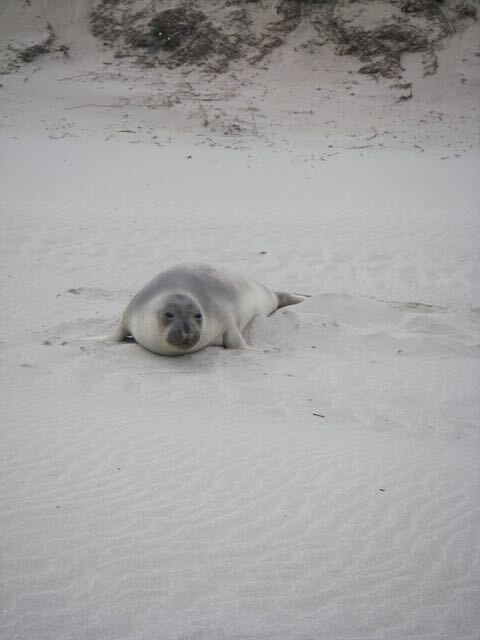 The males weigh in at a ton or two and are very territorial. They will come after you. 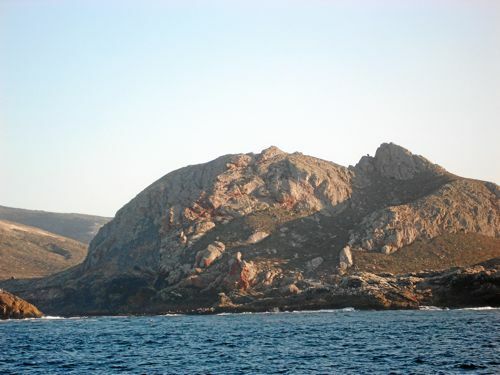 The ecosystem of the island was devastated by feral sheep. They ate everything, roots and all, and the island became a sandbox. 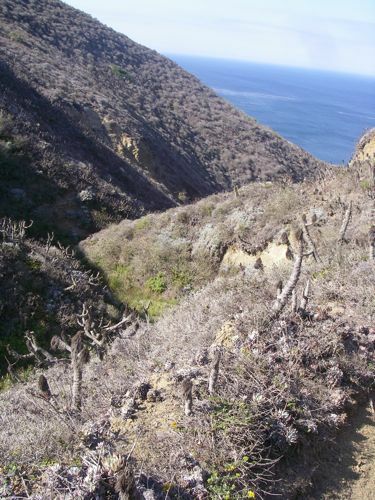 The reforestation program … well, there wasn’t one other than wait-and-see. The island is now mostly covered by plants courtesy of the lupine. The guess is that a few of these plants or perhaps just seeds, were in gullies and under rocks inaccessible to the starving sheep. 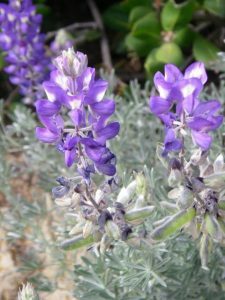 They eventually bloomed, but their important contribution is that they are nitrogen fixers that take nitrogen from the air and “fix” it in the soil, giving nitrogen-dependent plants a favorable environment. Ecology notes: The environment is recovering after being devastated by ranch animals, mostly feral sheep that were abandoned when the ranching operation was wrapped up. 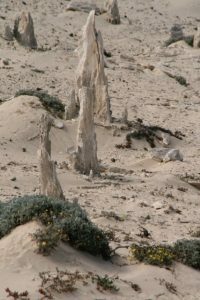 With little ground cover, the wind swept the landscape, gouging sand rivers through the terrain, which are most distinctive in aerial photos. 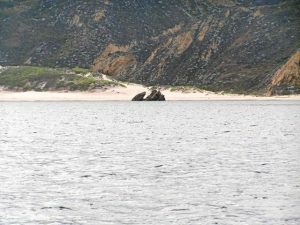 In addition to elephant seals on the harbor beaches, we ran into a pod of humpbacks in 2006 – more accurately – they joined us on our way toward Santa Rosa. Seven (or so) animals including two juveniles. In 2007 and 08, Fin Whales joined us for over an hour of whale frolcking. No whales for us in 2017. Entering Cuyler from the NE, passing Harris Pt with Nifty Rock and Hare Rock in sight. Prince Island -- If you're not a ranger, an ornithologist or some sort of bird, you're not allowed to set foot on this avian refuge. 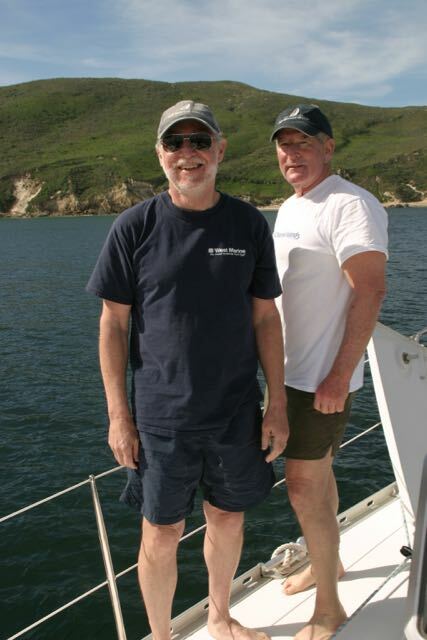 The Bosun and Capt. Dan Feb 5, 2011 .... what a difference a day makes. 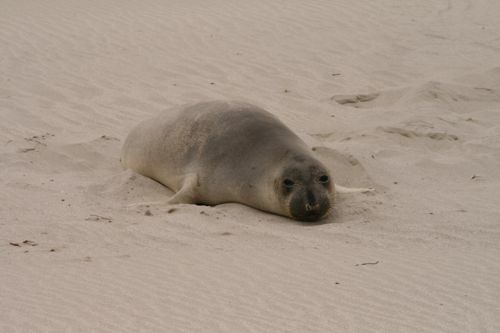 Elephant seals cover many of the beaches. Bull elephant seal moves aggressively to protect his harem.